We are now at the Winnebago Grand National Rally. 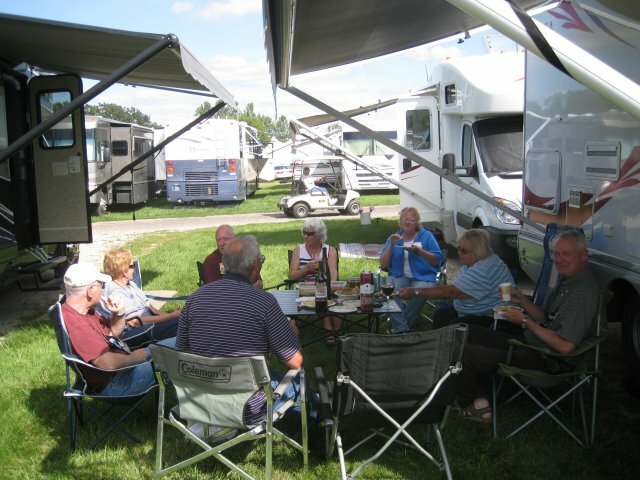 There are over 1,200 motorhomes and 2,600 attendees. The rally is superbly organized. On arrival you check in and escorted to your site. There is power but no water. We are in the View/Navion section in a pod with 3 other Views. It didn't take long after arrival before we were all in a ring with wine and cheese. One couple has been living full time in a 40 ft motorhome for 15 years. They have rented in Australia and New Zealand. They just downsized to a Winnebago like ours last week and drove here directly. Another in our group is an engineer and worked for 3M. A third works for the Nolin Milling company which manufactures and maintains the world's largest inventory of grain spouts. This is important stuff to know if you have a farm with a silo. Tonight they had the grand opening with singing, a parade, and a few short speeches from local dignitaries and the Winnebago CEO.